Dr.Horejsova newly opened a consult clinic for the prevention of lifestyle diseases including obesity. "Good education and healthy lifestyle are quality investments independent on time and space"
Homocysteine is the best single indicator of how long you live or whether you die young for any of the diseases of civilization. Lifestyle modifications and appropriate doses of vitamins and minerals can add 20 years of life in high quality and in good health! The aging of our body is not some kind of a mysterious and magic process but a simple biochemical reaction. The aggressive free radicals attacking the DNA cell walls are produced within our bodies. However, our body also contains a natural defense – ANTIOXIDANTS. When you come across a person in public who has got a cold or a flu, you immediately start to think – get away from me, I don’t want to catch anything. But you can’t order anyone to stay in bed, not to spread a virus further on. Start with yourself! If you desire to prevent diseases, you ought to train your immunity system the same way you exercise your muscles. Which metabolic type are you? Do you feel good? Full of energy? Do you have your optimal weight? 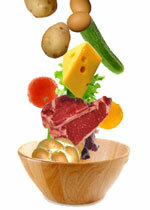 If yes, then you are eating healthy in accordance to your metabolic type. If not, you have an opportunity to improve it. A short test will show you which metabolic type are you. Education - teachers, trainers, interest facilities.